The premise is ingenious—with allusions to the "battle" between Starbucks and mom and pop coffee houses, screenwriters Chris Poche and Karey Kirkpatrick (Over the Hedge) decide to take a slacker's-eye view of corporate America by setting the bulk of the script’s action in a mom and pop breakfast bar. Yes, you read that correctly—in Flakes, we’re granted access to the tiny bar by the same name which, although owned by barely functioning airhead hippie Willie (a wasted Christopher Lloyd) is run by young, hardworking manager Neal Downs (Aaron Stanford). Similar to the way that snobbish Rob (John Cusack) coveted obscure albums and cherished Top Five Lists in High Fidelity, Neal is equally fetishistic about the product he peddles— namely, breakfast cereal-- which he serves up like a bartender to the bar’s regulars including stoners, cereal collectors, and even a pretty groupie named Strawberry, mixing equal parts of one with another, knowing when to cut someone off and when to clue them in on a cooler confection. 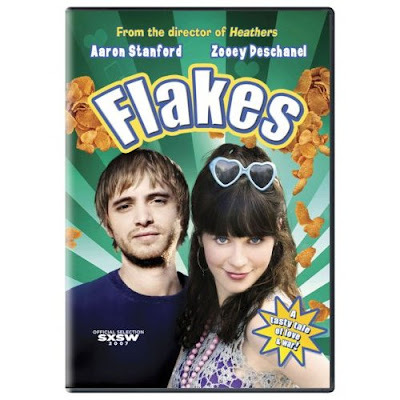 When his self-employed artist girlfriend, Miss Katz (the fabulous Zooey Deschanel) quits hawking her collection of ironic handpainted t-shirts, she tries to convince Neal to take a week off and hire her in his place so that he’ll finish the CD he’s been working on for ages. Worried that mixing business with the bedroom will kill their relationship, Neal negotiates with Miss Katz to move in with him instead but business interferes anyway when they meet a determined grad school yuppie named Stuart (Keir O’Donnell). Essentially summed up by Neal as a “Banana Republic Guy,” the enthusiastic Stuart decides to rip off both Flakes and Starbucks by opening a larger, cleaner and more professional version of Flakes directly across the street after he’s unable to convince Neal to join him in franchising Willie’s cereal bar. Seemingly confirming Miss Katz’s suspicion that Neal may think of himself more as a cereal guy who plays music and less like a musician just holding down a job, Neal abandons his CD work and declares war on Stuart’s bar, which puts an even greater strain on their relationship when a fed up Katz accepts a job with Stuart to try and force her boyfriend to wake up to what is really important. Although the terrifically inventive premise coupled with Deschanel’s pitch-perfect delivery of the dialogue consisting of her trademark combination of cynicism and charm temporarily elevates the film from its small-screen set-up, ultimately it’s a forgettable, highly inauthentic time-waster where the characters seem about as real as Tony the Tiger. Initially, Flakes does impress with its enchantingly atmospheric New Orleans location, offering it up like a surprise toy in a box of cereal but unfortunately the setting much like Deschanel and Lloyd, is given very little with which to work in yet another bummer flick from Because I Said So helmer Michael Lehman following his adorable Truth About Cats and Dogs and cult classic Heathers. Overall, the downfall of Flakes comes in trying to combine Reality Bites with High Fidelity by pouring on more sugars and toppings in the hope of disguising the finished product. Instead of a balanced breakfast, in the end you’re left with a woefully unbalanced film... not to mention one with a distinctly bad sour milk and Froot Loops aftertaste when you realize how much potential it had to make it work.